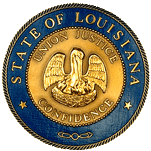 SCR55 WALSWORTH MOTOR VEHICLES - Authorizes and directs the Department of Public Safety and Corrections to produce and issue "Louisiana Bicentennial 1812-2012" license plates for private passenger motor vehicles. HB295 HUTTER PUBLIC BLDGS/GROUNDS-ST - Authorizes the board of commissioners of the St. Bernard Port, Harbor and Terminal District to name the administration/security complex building of the port in honor of Samuel B. "Sammy" Nunez, Jr.